During the reception, traditional Japanese tea ceremony demonstrations incorporating high-quality Shigaraki tea bowls will be held at 3pm and 4pm at a cost of $10 per person, and will include handmade, organic wagashi (traditional Japanese sweets). RSVPs are required for the tea ceremony and can be made by calling the Shumei Hall at 626-584-8841. Shigaraki, located in Shiga prefecture close to the ancient capital of Kyoto, is one of Japan’s oldest kiln centers, and has produced stoneware ceramics since the 12th century. 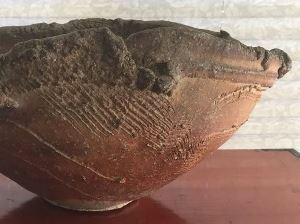 Shigaraki wares derive much of their character from the local silica-rich clay sourced from the bed of nearby Lake Biwa. The clay is also rich in iron, which gives the body its warm orange tone, and feldspar, which bursts out onto the surface during firing and creates a characteristic rough texture. During high-temperature firings in anagama (single-chambered sloping kilns), the wood used to fuel the kilns creates ash that lands on the surfaces of the objects and creates patches of natural brown and green glaze. All of these chemical factors in the creation of these ceramics resulted in warm, rustic wares, seemingly born organically from the earth. Though these ceramics were originally utilitarian, their natural beauty made them highly prized by tea masters as wares for the tea ceremony, and since the 16th century, tea bowls, jars, dishes, vases and other vessels from the Shigaraki kilns have been one of Japan’s most beloved and collected ceramics. Curated and organized by Japanese art historian, Meher McArthur. This exhibition is part of the AxS Festival, a regional celebration of art and science, based in Pasadena and surrounding communities. It has been made possible thanks to the generous support of Gordon Brodfuehrer, Wilson Grabill, Wakae Nakamoto, the Mingei International Museum, San Diego, and Japan Foundation, Los Angeles.